I don’t know if there’s any kind of pie I don’t like, but strawberry rhubarb pie is without a doubt my favorite. In January, opening a jar of this jam is the next best thing to pie. It’s peak strawberry season here now, so I made a big batch of jam last night, and we may have to have pie this weekend too. I’ve never used commercial pectin in my jams. The main reason is that commercial pectin requires a ton of sugar to make the jam set properly, and it makes my teeth hurt just thinking about it. 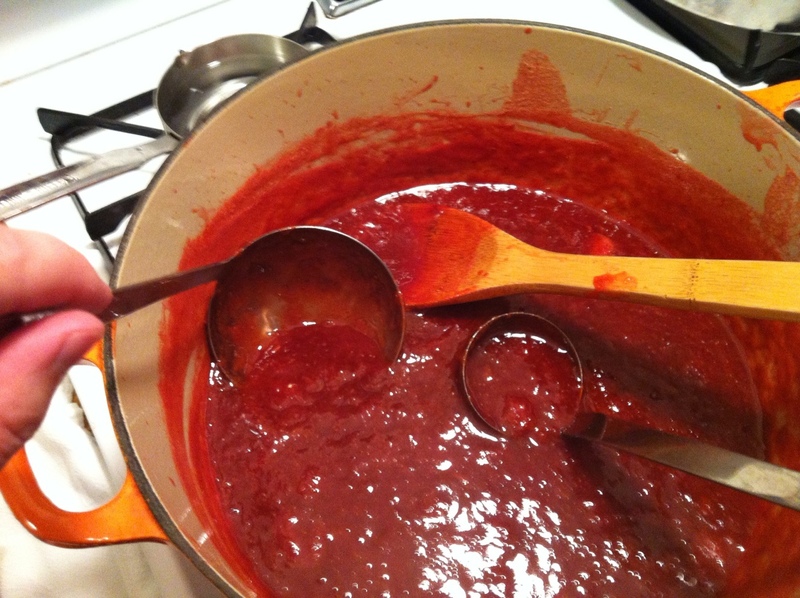 When I first started making jam I would just cook it down until it was thick. 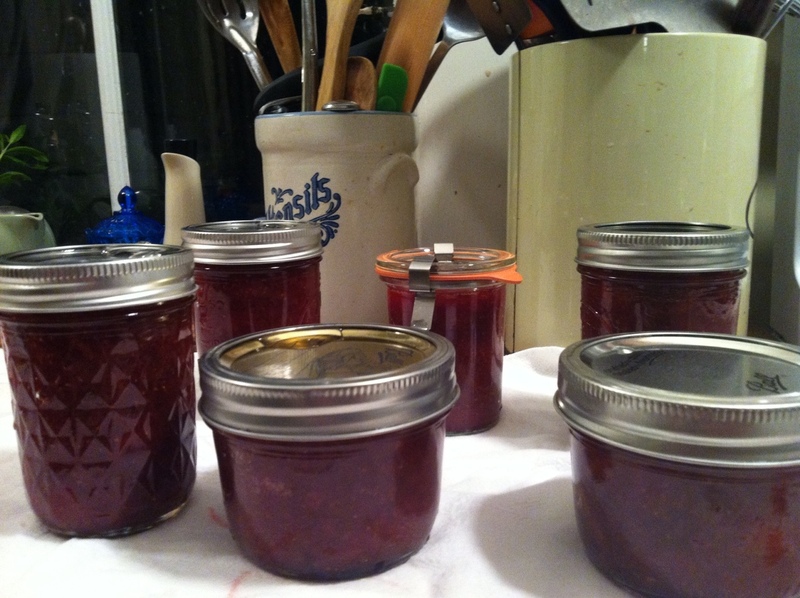 It doesn’t really gel unless you’re using high-pectin fruit, but I like my jam on the softer side anyway. Last summer I discovered Linda Zeidrich’s method, decribed in The Joy of Jams, Jellies, and other Sweet Preserves, of using the natural pectin in citrus fruits and it works beautifully. This is my go-to method for making jam now. Combine the strawberries, rhubarb, and 2 cups of sugar in a large, heavy pot and stir well. Juice the lemon and add the juice to the fruit mixture. Scrape out the seeds and flesh from the lemon, and tie them up securely in a square of cheesecloth or put them in a tea ball and add this to the pot. (The natural pectin in the lemon will help the jam to set.) Cook over medium-low heat until the sugar has dissolved and the fruit has softened. Once the fruit begins to break down you can taste it to see if it’s sweet enough. At this point you can add a little more sugar if you think it needs it. It should be sweet but you should still be able to taste the tanginess of the rhubarb. Mine was just right with 2 cups of sugar, but if your rhubarb is very sour you may want to add a little more. Turn the heat up to medium high and cook, stirring almost constantly, until it begins to thicken. You can test it by dropping a little puddle of jam onto a cold plate. Let it cool for a minute and then run your finger through it. If it feels like jam, it’s done. Remove from heat, fish out the lemon bundle, and give it a good stir. 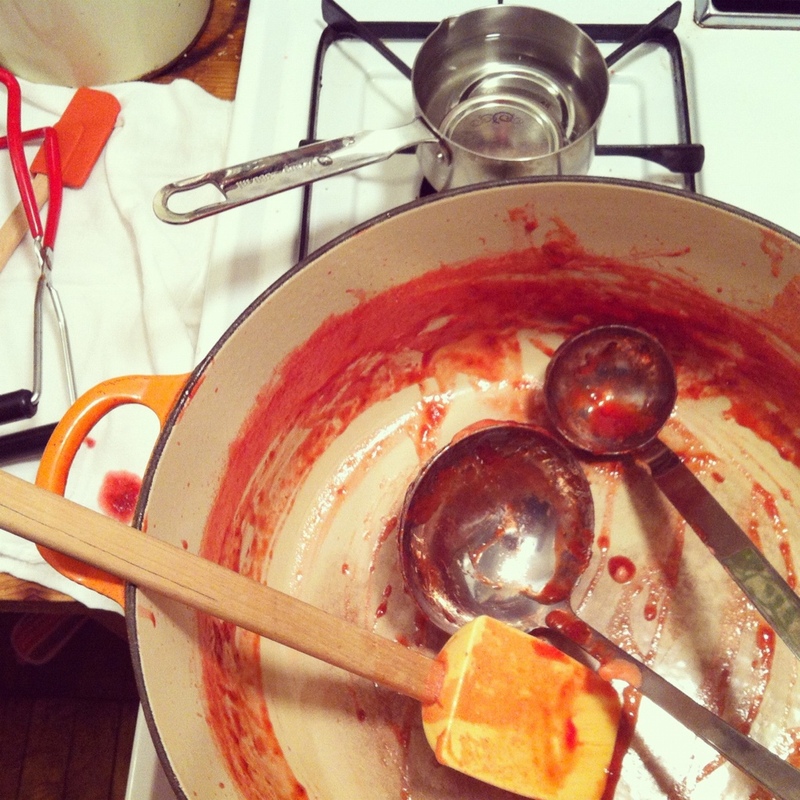 Ladle hot jam into clean, hot half-pint jars leaving 1/4 inch headspace. Process in a water bath canner for 10 minutes. This recipe makes about 7 half-pint jars. Posted on June 1, 2012 by kate. This entry was posted in Preserving and tagged cooking, food, jam, preserves, Preserving, recipes, rhubarb, Strawberries, summer. Bookmark the permalink. Ooh! I love the idea of using natural pectin from the lemon and will definitely try this! I’m with you – I don’t like super sweet jam! I recommend you check out the book I mentioned in the post. Lots of helpful information about using the naturally occurring pectin in fruits. She even tells you how to make your own concentrated pectin from apples or oranges. Tons of recipes, and none of them require commercial pectin! Thank you so much for sharing this! I am not a fan of really sweet jam either. Sounds lovely – I made a rhubarb crumble yesterday, and remembering that my mum used to put a few strawberries in as well if she had some, I tried it and can recommend that option too. Really rounds out the acidity of the rhubarb. I think I’ve only ever used (store bought) pectin once. The cherry jam I made over the weekend used lemon and a granny smith apple. Worked wonderfully!